Thank you for your patience today! 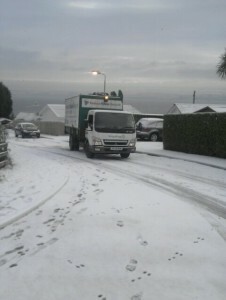 Recycling kerbside collections for Ardbeg & Port Bannatyne are disrupted today. Unfortunately due to a technical fault with our bin lift, we had to return to depot this morning. We used our Luton van to collect plastics and cans however paper/card uplifts were delayed. Technical fault has been fixed. We have been able to collect paper through Ardbeg, unfortunately we have been unable to complete paper collection in Port Bannatyne. Please take your blue bins back into store. If your paper has been put out in white bag and is now wet, please transfer to black bag for storage outside and put out with your recycling as normal on next run on Wednesday 11th February. We apologise for any inconvenience this may have caused you and thank you for your continued participation.